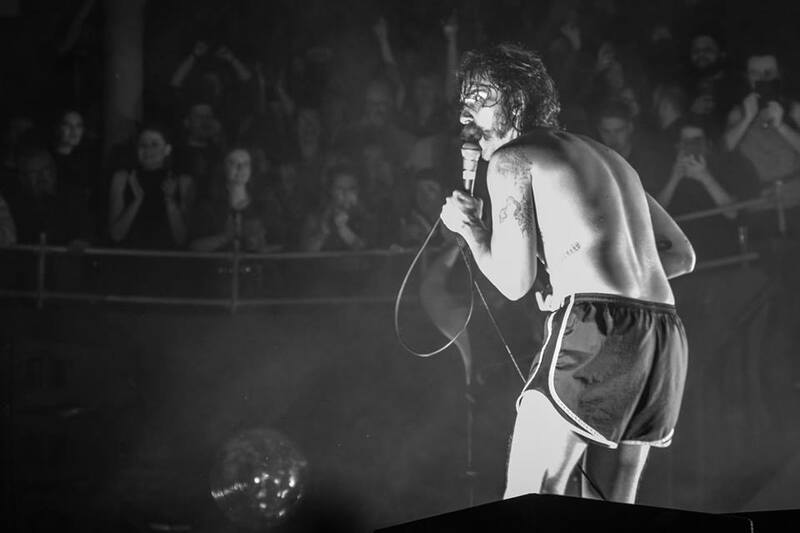 IDLES, the nations’ sweethearts play their biggest ever headline show and Getintothis’ Steven Doherty is on hand with how it turned out. People seem to love the Albert Hall in Manchester. They seem to be able to ignore the fact that there are very limited great vantage points, it always seems over-filled to the point of discomfort and more importantly, it’s 6 pounds for a pint. Tonight though, the sheer inconvenience of the venue works in Getintothis’ favour. Having to get in the venue so early to get a decent spec, it means we are here in plenty of time of Crows. And how glad we are we did. They are simply stunning. Having recently been signed to IDLES‘ singer Joe Talbot’s new label Balley Records, it could seem like a ill-advised favour having them as support for their UK tour, but Crows are very much here on merit. Tracks from their recently released debut Silver Tongues are unleashed, building towards the two-headed crescendo of Whisper and Chain Of Being. For an audience mostly unfamiliar with the songs, they get a glorious welcome. A band that is clearly going to go from strength to strength. With such a strong opening act, you feel that IDLES will have to be on it from the off. And on it they most certainly are. 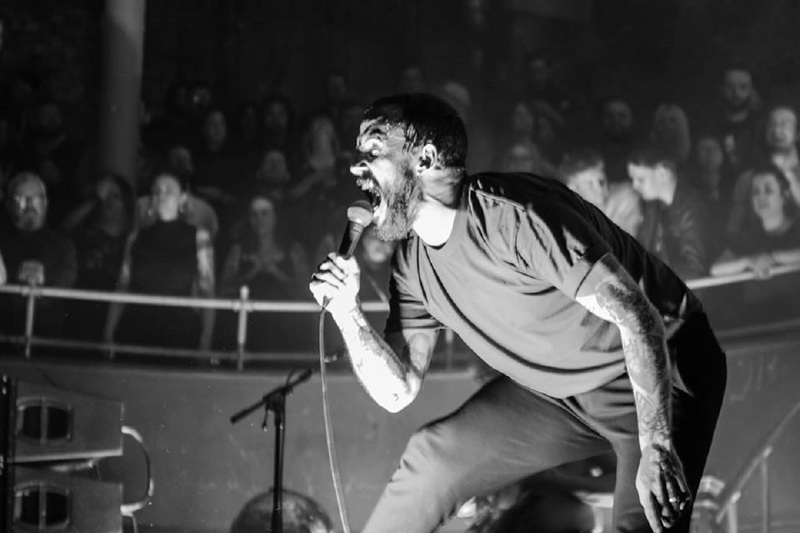 Since announcing this short UK tour of similar sized venues, they have already outgrown them, with tickets for tonight sold out in a matter of minutes, and IDLES are clearly in the mood to repay the ever-growing loyalty. From the brooding drawn-out intro of Colossus, there is not one let up in the next 90 or so minutes, no drop in pace, this is pure ferocity from band and crowd. IDLES have no fillers, no lulls, no time to waste on such frivolities. Every song has a message, exquisitely delivered to these baying hordes and adored, received and reciprocated by us masses. Even in such a venue as this, the biggest they have headlined this far, they can still make it feel like an intimate gathering. The band spent large chunks within said crowd, at one point Talbot looks to his left to find his guitarist up on the balcony. Later on Exeter, two audience members will find themselves onstage playing guitar. It is that kind of evening, almost religious in it’s fervour..
After their BBC 6 Music sponsored Liverpool gig a couple of nights previously, the more sweary hard-hitting songs return to the set, including 1049 Gotho, one of the bleakest descriptions of a depression sufferer you are likely to hear. Talbot addressed the criticism he has received from the green-eyed monster that is Sleaford Mods, about how they shouldn’t be allowed to address issues of social justice, as they are perceived to be working class, as if only the poor are allowed to discuss the poor. This gets the biggest and most deserved cheer of the evening. The now customary set closer Rottweiler tears through this building, the kind of place that IDLES must surely be already looking back at through the rear view mirror, on their way to this summer’s big festival slots and arena tours. These snowflakes are an avalanche.